People say Francis is a Marxist, but he says something more interesting. He says Marxism stole away a traditional Catholic issue. (I defy you to find a canonized saint who wasn’t radically “poor and for the poor.”) Marx has it wrong, because he doesn’t think like a Christian. We have to recover the Christian view. 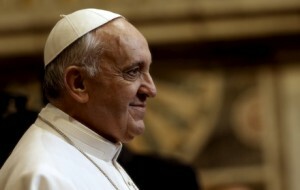 One of Francis’s addresses from his recent trip to Latin America gives a good starting point. The piece is clearly organized. The first section says, “we want change” in society. The second says, “you are sowers of change.” The third talks about what kind of change. One large section talks about an economy at the service of people, the second opposes kinds of “colonialism,” and a third short section mentions the environment. When he says, “we want change,” he lists various forms of exclusion. The problem isn’t exactly poverty or income inequality. The problem is the hopelessness of feeling like you are not even part of society: not part of the educational system, not equally protected by the laws, not wanted. I think of inner city black kids. Poverty is one thing; exclusion is much worse. Previous Popes have said this, Francis says it more directly. This is hard reading for some religious Americans, because Marx talked about exclusion too, and we tend to expect that the kind of change he proposes must be Marxist change. But Francis quickly makes one of his central points, and it is anti-Marxist: “Yet there is an invisible thread joining every one of those forms of exclusion,” he says. “An unfettered pursuit of money rules. The service of the common good is left behind. Capital becomes an idol.” This is, in fact, the language of Scripture and the Tradition, though we don’t like to hear it. Much of our political dialogue is about how to get money: either through the free market or through government redistribution. Francis’s answer is that both are wrong, because both focus merely on material acquisition. The real problem cuts through the human heart. The real problem requires conversion, from love of money to love of neighbor, and love of God. That’s Gospel stuff. Marx does not tell you to love your neighbor. He tells you how the poor can steal money from the rich. The second section, “you are sowers of change,” adds a key point. It is not government that can cause this cultural change. We are not looking for new laws – though a converted society would have new laws. What we are looking for is cultural conversion. And that begins at home, and with the people around us. We are talking about evangelization and repentance, not politics. He says, “don’t expect a recipe from this Pope.” He is not proposing public policy. He is proposing “genuine interpersonal encounter” with our neighbor and “daily proximity to their share of troubles.” One of his examples is “working generously in the fields of health, sports and education.” Sports! Working to make a happier, more human world, by the way we treat our neighbor. Also helping them make a home, founding “cooperatives”, “favoring businesses.” This isn’t Marxism. It’s working together, loving our neighbor. In the third section he talks about economics. “The economy should not be a mechanism for accumulating goods, but rather the proper administration of our common home.” Those are strong words, but what do they mean? We return to the love of money vs. the love of neighbor. Obviously we need to make enough money for our families. But obviously, too, we can think about our jobs only in terms of how much stuff we can get, or we can think instead about how we can serve. Don’t think about how high taxes should be. Think about your job. Your friends’ jobs. How can we make our work into a way to make the world a better, more loving, more beautiful place? Finally, he talks about “colonialism.” This sounds like Marxism, but again, his answers end up being anti-Big. He talks about the dangers of “transnational companies.” This is something Pope Pius XI was saying in the 1930s: huge corporations just can’t exercise that “social poetry” like small businesses and “local economies” can. It is true, he says, that we live in a world of “interdependence.” We can’t wish globalization away. Interdependence means big businesses, too – some things require the complicated cooperation that Big Business and even Big Government is good at. “Interaction, however, is not the same as imposition.” Just because we have cooperation doesn’t mean we have to stamp out local creativity. We should work for that local creativity, local color, local cooperation. We should work, above all, for a world where neighbors promote one another’s whole good – not only economic, but also social and cultural and religious. Only neighbors can see what that good is. Only neighbors can love one another. That affects how we vote, yes; we want governments that allow neighbors to love one another. But this isn’t about government programs. Fundamentally, it’s about repentance – and the richest kind of repentance, from the mindlessness of mere acquisition into the creativity of loving our neighbors. Where do you see people creatively loving their neighbors? What could you do?